Medium-chain triglycerides (MCTs) are a special type of fatty acids which are metabolized more fully for energy in the body. Normal fats and oils contain long-chain fatty acids (LCTs). When compared to these fatty acids, MCTs are much shorter in length thus resembling carbohydrates more than fat. As a a result, they are more quickly absorbed by the body and metabolized as fuel. Because of this quick metabolism, the calories in MCTs are very efficiently converted into fuel for immediate use in the mitochondria, instead of being stored as fat. 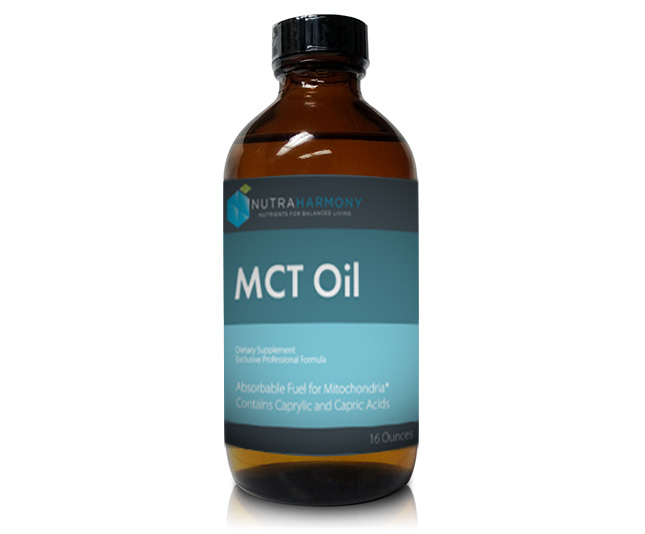 MCTs have been shown to enhance thermogenesis (heat production) in the body, thereby promoting the burning of fat. MCTs contain fewer calories than LCTs, are metabolized quicker and actually contribute to an enhanced metabolism to burn even more calories! Directions: Take 1 tablespoon two to four times daily or as directed by your healthcare practitioner. Caution: Keep out of reach of children. Storage: Keep tightly closed in a cool, dry place. Contains No: Milk, egg, fish, shellfish, wheat, tree nuts, peanuts, soy, corn protein, yeast, animal products, artificial colors, sweeteners or preservatives. Other Ingredients: 100% USP (United States Pharmacopeia) Verified MCT Oil (from coconut oil).